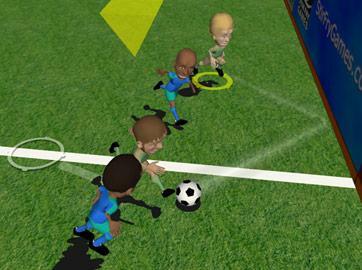 Over-the-top arcade soccer action! 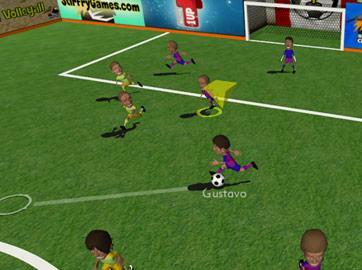 Bicycle kicks, headers, one-touch passes, slide-tackles, instant replays, it's all here. New enhancements include mouse controls, and a two-button 'Casual Mode' for more laid back gamers. An RPG-style leveling system is used for the multi-season Career Mode featuring 64 teams from around the world. Play co-op or solo as you lead your team all the way up to the Division 1 Championship Game! 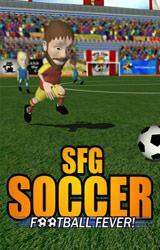 We all, or most of us, have played football or soccer games sometimes in our lives. The ones played the most are Pro Evolution Soccer, or FIFA, but some of us have heard about other games in the same genre which have the same theme, football, but in a different kind of way. There are funny soccer games, or soccer games in which you can only shot, train or something else. Here we have a little of everything. As it is an indoor soccer games, you play 6 vs. 6. As this is low budget compared with the ones which rule the football market, you won’t be finding any team that look familiar at all. The teams are named by the names of the cities all over the world. With totally 64 teams to choose from, and 4 divisions to play in you get a nice range in playing games. 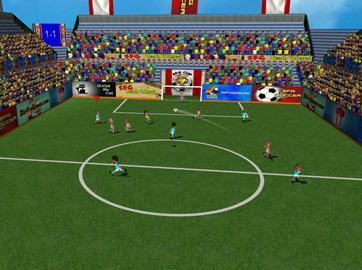 As the game is played in two modes of difficulty, easy and normal, you will find some difficult matches that can surprise you through the gameplay, especially in the 1st and 2nd division, but if you have at least some football gaming skills finishing this game shouldn’t be too big of a problem. You can change the game camera view that is the view over the match in a couple of different formats to the one you like the most. As for the duration of the game, it depends on how long you want it to last, as there are several possible durations. You can choose from 2 to 10 minutes per match and you don’t have to worry about the half time whistle as there isn’t any. The game offers a couple of game modes which you can play, from Exhibition, Career and Practice. In Practice mode you can practice all your team and al the moves done by the team to perfection your skills in the game and to handle better with your opponents in the matches. Exhibition matches are usually for those who want player against another player or practice his game against the computer, in the games, and not just practice mode. Like previously said there are 64 teams, already predefined by the game, and you can’t change much about them through the matches. Probably the most exciting and the best mode, you will enjoy is the Career mode. If you are a football fan you probably already know all about the players from the team you cheer for, but if you don’t there is always Google. Anyway presuming you know or have the characters or teams biography in sense how you want them to look like and to define their strengths in certain sections, you can assemble the team you want make the players look like them by skin, some facial characteristics, the names of the players can be changes too and of course to make the outfits of the players resemble the colors and the wardrobe of the team you want them to look like. You start the game from the 4th division and you must climb up all the way to the 1st one. You must play 15 matches in total once with each of the teams. After that you go to the playoffs. You are awarded with points used for enhancing the player’s abilities. And there is another thing, there no fouls. You can get a foul or a red, or a yellow card. As we are talking about an RPG game based graphics, you can’t expect the best graphical interface and details, but he game is surely something worth of playing. The sound of the game is pretty decent, as there are some bad sounds from certain scenes, but in this category of the game you get plenty is the fun is guaranteed.